Phnom Penh, Cambodia – 26 March 2014. In 2013, Cambodia welcomed 4.2 million tourists, an increase of 17% from the previous year. This rapid growth of tourist arrivals is expected to continue year on year, raising concerns about how to ensure that local children are only positively impacted by tourism. Tourism destinations attract vulnerable children and families seeking an income. These children may engage in income earning activity on the street, making them particularly vulnerable to abuse and exploitation. Today marks the launch of a new nationwide Child Safe Tourism campaign by World Vision Cambodia in partnership with the Ministry of Tourism. 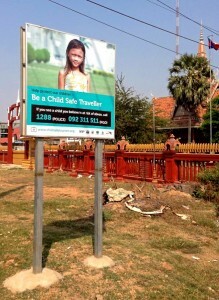 The campaign aims to prevent child sexual exploitation in the tourism sector by enlisting responsible tourists to keep children safe from any abuse occurring in the first place. This campaign is part of an Australian Government initiative – Project Childhood Prevention Pillar – that aims to prevent child sexual exploitation in tourism in the Mekong sub-region. The campaign is also being run in the neighbouring countries of Lao PDR, Thailand and Vietnam. In partnership with the Ministry of Tourism, World Vision has produced 120,000 stickers, 10,000 tent cards and 36 signboards with Child Safe Tourism messages, which are being distributed in key tourism locations through government, public and private stakeholders working in the tourism sector. During today’s launch, the Cambodian Association of Travel Agents committed to take a leading role is disseminating the campaign throughout Cambodia. “Most tourists come to enjoy the beautiful attractions and culture that Cambodia has to offer, but child sexual abuse committed by a handful of tourists is a major concern for Cambodian society as well as the globe”, says His Excellency, Hor Sarun, Under Secretary of State of Ministry of Tourism. “Children are the future human resource and they should be protected from all forms of abuse”, adding that the Cambodian government encourages all people to take part in building a Child Safe Tourism environment in Cambodia. Last year World Vision conducted market research with travellers to the Mekong region about their encounters with children and found that“many tourists wanted to help at-risk children, however, they were confused about what actions they could take and wanted more information”, said Mr Phang Chanda, Project Childhood Coordinator for World Vision Cambodia. “These materials provide useful information and advice to help travellers make responsible choices and take a stand against all forms of child abuse,” he says. “The materials will also allow local residents and private stakeholders to take more action to better protect children”. The formal launch of the campaign takes place today at the Ministry of Tourism, in Phnom Penh, Cambodia, from 8:00-10:15am, with attendance by government, United Nations agencies, community organisations and the private sector.